(Bloomberg) -- Citigroup Inc. bought a skyscraper that it was renting in London for about 1 billion pounds ($1.3 billion), a person familiar with the matter said. The lender acquired 25 Canada Square, a tower in Canary Wharf where it has been based since 2000, according to an internal memorandum obtained by Bloomberg News. Owner AGC Equity Partners Ltd. had initially sought at least 1.2 billion pounds, Bloomberg reported in October. Capucine Boncenne, a spokeswoman for the bank in London, declined to comment on the purchase price. 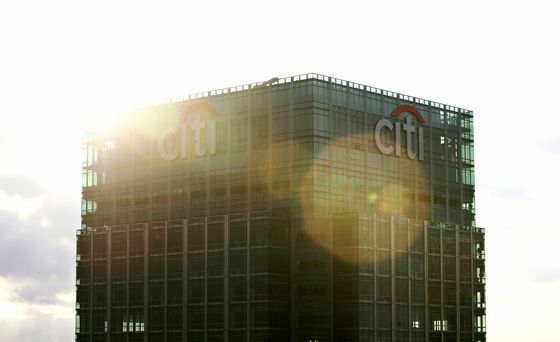 “The transaction is part of Citi’s global strategy to own, rather than rent, its major office buildings and cut expenses in the long term,” Boncenne said in an e-mailed statement. Representatives for AGC Equity didn’t immediately respond to requests for comment/declined to comment. Citigroup has been renting all of the space in the 25 Canada Square tower on long leases linked to inflation, and sublet most of the building to other tenants, the person said. The tower encompasses about 1.2 million square feet, the equivalent of almost 19 soccer fields. Together with the adjoining 33 Canada Square, the building is known as the Citigroup Centre. AGC bought the building in London’s Docklands financial district for a reported 1 billion pounds in 2013 using a 661 million-pound loan from Bayerische Landesbank. That loan was refinanced by French lender Societe Generale SA last year. The building was valued at 1.2 billion pounds by a BNP Paribas SA unit, according to a May filing.